One more day until we find out if the milkshake is a girl or boy. We are very excited! We went to Home Depot the other day and I grabbed several some paint samples. As we were walking out I was showing the hubs and asking what he thought, and he kept saying he wants the room to feel welcoming and warm. 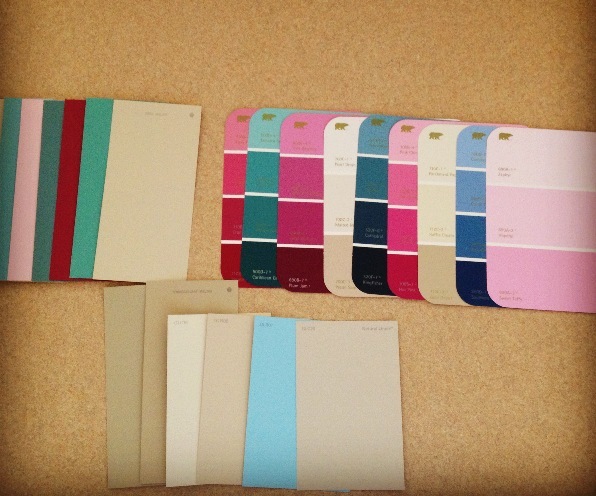 I know I know, honey, me too, but what about the colors, do you like the colors for a dresser or soomething fun and funky? He kept saying he wants it to be light and comfoting and the dark blue would freak a baby out and why would we paint our walls dark blue? Once I reminded him I am thinking of painting the dresser, and only the dresser, a fun color he had a little sigh of relief. The walls will be one of the lighter beige colors..the fun colors will be for curtains, possibly the dresser (need to find one still), maybe some MommaE painted canvases, pillows, etc. We won’t be painting the room midnight blue or beet pink. A few hours later I was saying how excited I am for our appointment Thursday, and I hope the milkshake shows us the goods. Hubs looked a little confused and said, “That’s how they tell you if it’s a girl or boy? They look at their parts?” *A little disclaimer….we don’t have many friends with babies, and hubs used to tune out completely when baby talk came up, so he really has no idea how all this baby stuff works. * I told him, “Yeah, they look between their legs. What did you think?” He thought it was a blood test or something along those lines. I’m now scouring Amazon for a good book for first time Father’s…any suggestions? Oh, Father…you crack me up!